I’ve been working as a personal trainer for more than seven years, and if there is one thing that people have as a goal– regardless of their starting level of fitness or activity preference– it is to do a pull up. I’ve blogged about the specificity of training required to learn to do a pull up, and I included them as a bonus exercises when I ran my virtual bootcamp. But I still get a lot of questions about the best way to learn to do a pull up. To help you out, I’m going to run a five-week video blog series. Each week is one step to build up the strength and muscle coordination to do a pull up. Practice the move in the video each week, and then move on to the next step when the next video is posted. That will happen weekly on Thursdays. As it is only Monday, I want to give you a few ideas of how to get yourself ready for this virtual training. First of all, you need a strong and secure bar to use for your pull ups. If you’re a regular at the gym, this is easy. If you’re a home-based exerciser, you have a few options. 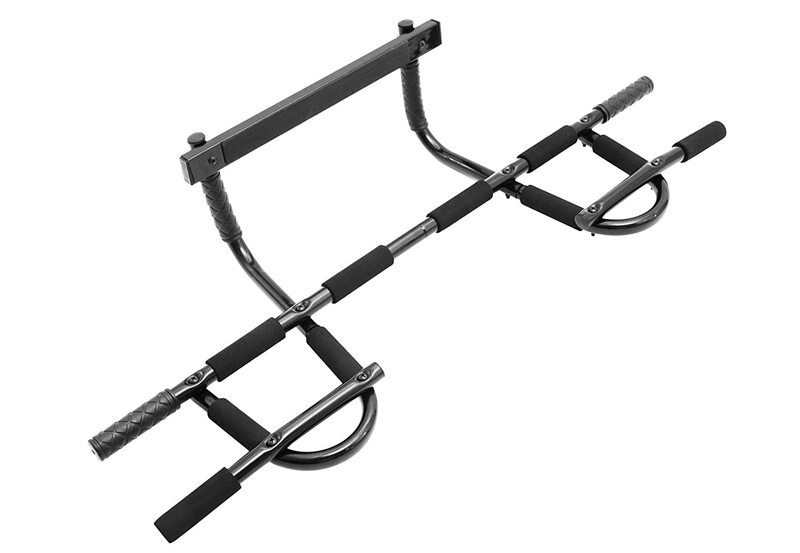 I recommend the J-Fit Deluxe Doorway Pull Up Bar. I have the first option, and I like it just fine. It’s easy to mount, easy to put away when I’m done, and it’s worked well for at least five years. Otherwise, you don’t need any equipment. See how easy this is going to be? All it requires is your dedication for a few minutes every day. The tutorial videos are about 30 seconds long. You’ll think about the body mechanics as I describe them, and then try to replicate it yourself. I’ll give you a goal for each week’s daily workout and a suggested goal before you move on to the next step. Get yourself equipped, and you’re all ready to go. Disclosure: The links included to the products are Amazon Affiliate links. OnBalance is all about combining family life with fitness for a lifestyle of wellness. I am contacted regularly by companies who would like me to review (or just flat out endorse) their product. It is rare, though that the basic premise of a fitness product aligns so well with my simple, straightforward, realistic approach. I’m please to say that the good folks at Flyup Fitness have developed a fitness tool that is easy-to-use, effective, inexpensive, and perfect for people who travel. The FLYUP is two rectangles, smooth on one side and slightly textured on the other. The textured side has holes where handles (included) can be inserted or removed easily, depending on whether you need them for a particular exercise. When you’re finished, you can stack the blocks together and insert the handles into the ends which makes the product compact for either storage or travel. I used the FLYUP several times before writing this post. 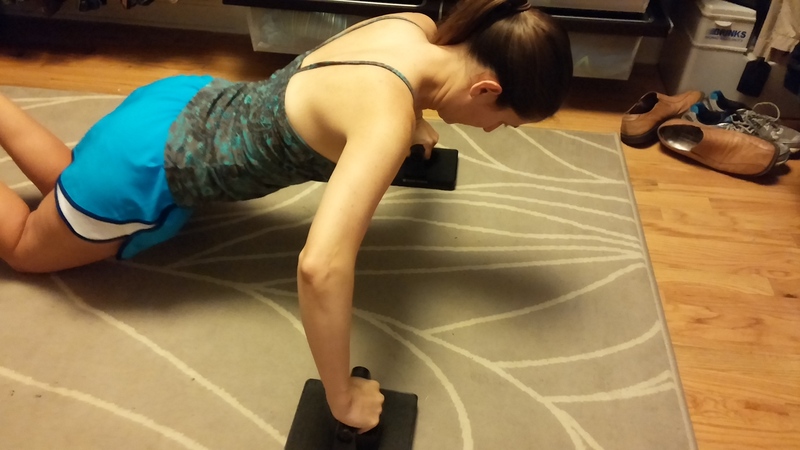 At first, I was uncertain how useful it would be, as I could only think of several variations of plank and pushups to do using it. I went to the Flyup Fitness website to check out the videos of exercise demos. I tried the exercises– first on my knees, then up on my toes for more of a challenge–and came away feeling like my core and shoulders were on fire. I started to figure out how the FLYUP would be good for travel, even when I’m taking a resistance tube– these little sliders require core stability in almost every exercise. The Flyup Fitness You Tube channel has a wide variety of videos introducing even more exercises. I found the videos easy to follow, and their informal, friendly approach gave me confidence. I liked that the videos gave quick overviews of several exercises rather than a do-as-I’m-doing-it video class format. That allowed me to learn the exercises, try them out myself at my own pace, and then move on to the next one when I was ready. The FLYUP is good for both beginners as well as advanced exercisers, as each individual can choose body position and unilateral or bilateral movement to modify exercises to a specific ability level. The only drawback to the FLYUP is pracitcal– it is to be used on low-pile carpet. My entire house has wood floors, and the only low-pile rugs are in my closet and The Monkey’s bedroom. He’s an 8-year-old boy, which means his low-pile rug is covered in legos more often than not. I did one workout in my closet (see photos), but I’m not too keen on being sweaty where my clean clothes are. I read the warning that comes with the FLYUP that using the product on anything except low-pile carpet could damage flooring or the FLYUP itself– I took the risk and used mine on the wood laminate in my laundry room. While I may be reducing the lifespan of my FLYUP by scratching the smooth surface slightly each workout, that’s better than never using them. Also, I’m not likely to use the FLYUP much with my clients, as I train so many pregnant women. Most of the exercises are done prone, so it’s not a great fit for expectant moms who aren’t already confident in their core, chest, and shoulder strength. 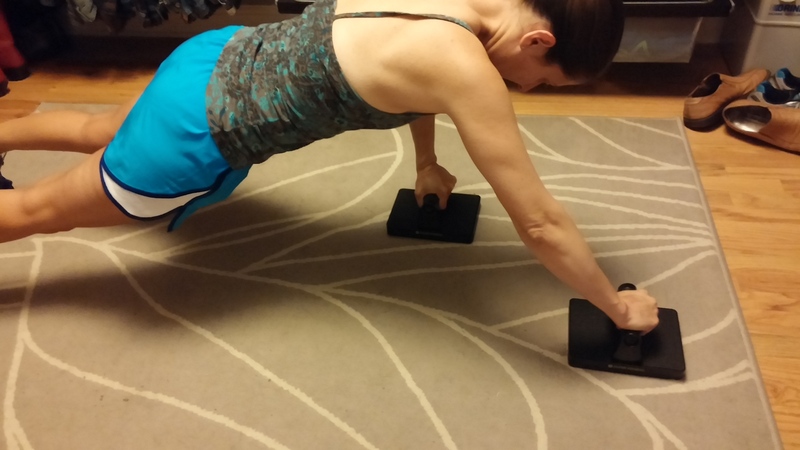 Regardless, it’s a great way to do deep abdominal work post-baby. The FLYUP is sold through the Flyup Fitness website for $40. I haven’t had mine long enough to tell you how they hold up over frequent, regular use. But I do think they are priced fairly and are a good investment, particularly for people who have little storage space or travel frequently. They’re also inexpensive enough that you could use them only occasionally to change up your strength training routine. Overall, I thought the FLYUP was a useful fitness tool that caused me to focus on my alignment and muscular integration in a new way. 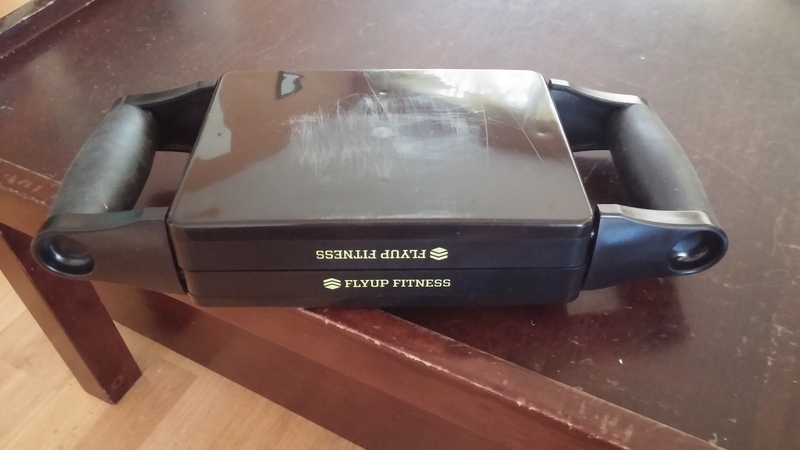 I received a FLYUP from Flyup Fitness in exchange for writing this review. The opinions presented in this post are entirely my own, based on my experiences of using the FLYUP.